Ford has always been a step ahead of the competition when it comes to the SUV. So the experts at Southern California Ford Dealers are not shocked that they've completely outdone themselves with the all-new 2019 Ford Edge. Available in four trim levels, available Intelligent All-Wheel Drive, and up to nine exterior colors, the 2019 Ford Edge is the first SUV designed by the Ford Performance Team, famed for their award-winning work in the motorsports world. Let's take a closer look at this powerful and stylish SUV that we believe will change the way drivers in Southern California get around the region and beyond. Depending on which trim level you choose, the 2019 Ford Edge offers a choice of two high-performance engines. The first is the turbocharged, direct-injection twin-scroll 2.0-liter EcoBoost puts out 245 horsepower at 5,500 rpm and 275 lb.-ft. of torque at 3,000 rpm. If you want even more performance there is the athletic 2.7-liter EcoBoost V6 that produces 335 horsepower at 5,550 rpm and 380 lb.-ft. of torque at 3,250 rpm. When you combine either of these engines with the 8-speed automatic transmission that can get an EPA-est. of up to 29-mpg highway in fuel efficiency. 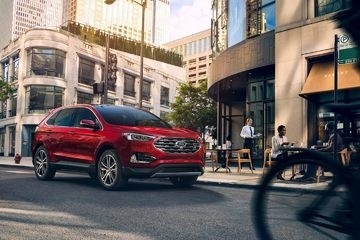 * Because of the connection with the racetrack, the 2019 Ford Edge gives drivers an incredibly responsive and smooth ride thanks to the front suspension with MacPherson struts and L-shaped lower control arm and an independent multi-link rear suspension with trailing blade control arms, isolated subframe, and stabilizer bar. 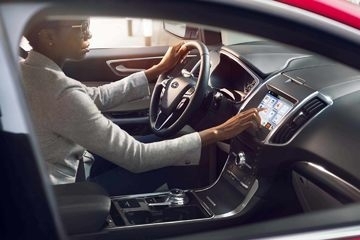 As with other Ford vehicles, the Ford Edge protects passengers and drivers with side-impact airbags with front and second-row safety canopy side-curtain with rollover sensor, SOS Post-Crash Alert System, and the Ford Safety System. On top of all the performance and driver-assist technology, the 2019 Ford Edge is also a perfectly priced luxury midsize SUV. This year, Ford is introducing the available SYNC3 with Ford+Alexa. This new system connects via the SYNC3 AppLink and adds the capabilities of Amazon Alexa to your SUV. It allows you to have access to voice navigation, traffic information, over 45,000 skills, Amazon Prime shopping, and can even control your supported Smart Home devices. There is also an optional B&O Premium Sound System by Bang & Olufsen as well as standard leather-wrapped steering wheel and perforated leather-trimmed sport bucket seats. We've just barely touched the surface of all the new features the 2019 Ford Edge has to offer. If you want to get a more detailed look at this high-performance SUV, use our Find Your Dealer tool, locate your nearest Southern California Ford Dealers, and take one for a test-drive.